After three-run call-and-answer in the 3rd, the Rafters piled on 11 runs in a 14-4 demolition of the Solar Sox yesterday afternoon. Three position players appeared in the game. Jake Noll was the starting DH and was 0-for-3 but hit two sacrifice flies. Daniel Johnson went 1-for-5 with an RBI. He had no defensive chances in center field and fielded just one ball, a single. Tres Barrera came into the game at catcher to start the 6th was 1-for-2 with a run scored. He had seven putouts, all on strikeouts. All three southpaw relievers saw (game) action as well. 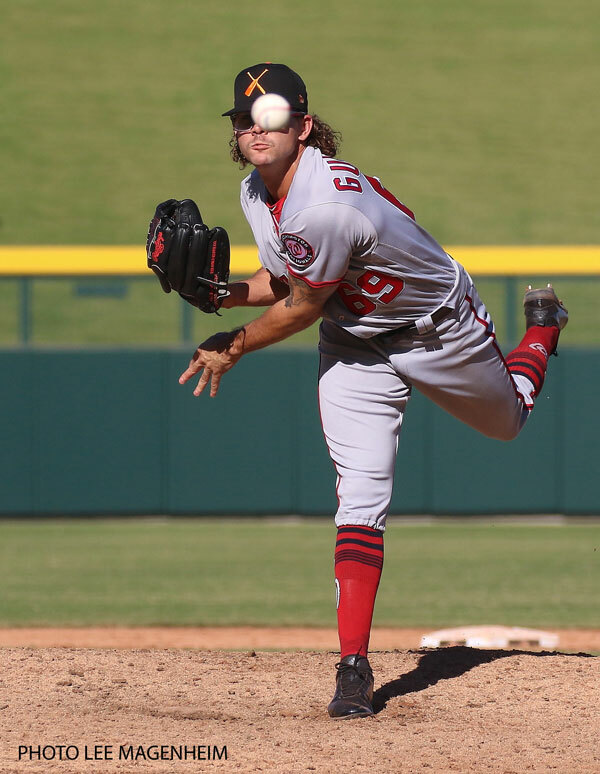 Ben Braymer stranded a runner while getting the last out of the 5th and then pitched a 1-2-3 sixth to retire all four batters he faced on 16 pitches, 11 for strikes. Taylor Guilbeau (pictured) gave up a hit but struck out two while pitching a scoreless 7th on just 12 pitches, with only one pitch that wasn’t a strike. Jordan Mill issued walk and fanned one while putting up a goose egg in the 8th despite throwing just six strikes on 14 pitches. The win improved Salt River to 11-7 and opened up a two-game lead in the AFL East while Mesa lost its fifth straight. This afternoon, the Rafters host the Desert Dogs. Guilbeau needs to be added to the roster to avoid being vulnerable in the Rule 5 draft. Think he will be, along with Bourque, Istler, and maybe Drew Ward. I’m not going to jump up and down one way or the other about adding Davidson to the 40-man, but if I were in an opposing front office, he’d interest me more as a Rule 5 candidate than Ward would. Without a defined position, though, one could argue that he may not be that vulnerable. I’m not gonna knock High-A relievers ever again after seeing what St. Louis got out of Jordan Hicks this season. Mercy. Catcher: My preferred solution is Wilson Ramos. It was a big mistake to ever let him get away, especially for an organization that prides itself on working with players through injuries and vulnerability. The Buffalo has rebounded from knee surgery and kidnapping, the team went to the playoffs with him, and he will give them more years of controllable catcher than they will get from Realmuto — all without depleting top-tier prospects. Harper: Let him go. I appreciate his positives, but without a limitless budget, the team can ill afford to clog up payroll for years to come if his injury/underperformance bug returns. Robles is a superstar waiting to happen, and so is Soto, and I believe in the return of Eaton after an offseason of rest. Eaton/Robles/Soto is a less luminous outfield, but one that will not keep the Nationals out of a World Series. It will simply be a different team, and a team that can get excellent use out of Taylor as a defensive replacement 4th OF and right-handed bat. 2B: I would bring back Murphy. The guy is a great team player and hitter, and Difo can spell him or play 2B when Murphy spells Zimmerman at 1B. The Murphy bat is simply too good not to get at the price he can fetch now, coming off this season. There are other options, but Murphy performed well here, is respected in the clubhouse. He can be a bridge to Kieboom (or Garcia), and that bridge should be flexible enough to allow for the uncertainty over Rendon (in case Kieboom heads to 3B). 3B: Sign Rendon long term. Worth it. SP: Needs work. If the Nationals can get a potential #1-2 starter (Grienke or Ray), especially if Harper and his salary goes, do it. Those players are underrated commodities, and players like Sale and Verlander prove their intangible worth. The Expos (thinking Ray) got Pedro Martinez just as he was getting to his peak. I think Robles is too high a price for much, barring an alternative (like Harper), but a #1 is a #1, as we have learned from the value of Scherzer. Bringing in a top starter makes Roark expendable, and at his expected salary, he should be. The rising starters are not at the caliber of Rey Lopez, although I think it too early to give up on Erick Fedde. Kyle McGowin is a guy I really hope gets a shot at the #5 job in the spring, or as the #6 next man up in AAA next year. Bullpen: Sign Holland. With Holland, Barroclough, a maturing Suero, a returning Glover, and Doolittle (of course), and perhaps JRodriguez, that’s quite a bit to work with. Then, sort out the lefty options. All in all, I’m inclined to think most can be solved with free agency. The farm system has eroded in quality and development in recent years, despite an outstanding 2016 draft. It would be nice to better develop the fruit for selling deadline pieces during the 2019 season, and allowing Kieboom and Garcia (a tender aged wild card) to ripen to better envisioned potential, while the Rendon and Turner (can he return to the track of his ceiling) trajectories sort out. I agree with so much of this. At this point they can sign either Harper or Rendon, but not both. I would love to see Murphy again but don’t really see it happening. Hope I’m wrong. If they can sign Holland, that’s a he’ll of a back end now.